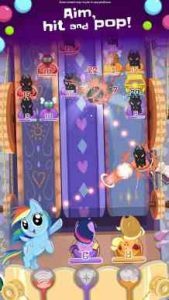 My Little Pony Pocket Ponies : In this ridiculously fun arcade game, join TWILIGHT SPARKLE and your favorite MY LITTLE PONY™ characters at the School of Friendship! As a new student, you are swept away in the first, awesome Pocket Pony Championship! Face-off against masters, students and teachers in thrilling arcade challenges using the unique Pocket Ponies figurines. Collect them all to make your perfect team! AIM at barriers and walls to get balls bouncing everywhere! RELEASE your Pocket Ponies’ magic to defeat enemies in fast-paced arcade challenges! LEVEL UP to get multiple shots going at once for crazy popping action! COLLECT unique Pocket Ponies, such as the Cutie Mark Crusaders or the Mane Six. No two are the same! RANK high enough to take on our legendary Pocket Pony Masters: RAINBOW DASH, APPLEJACK or PINKIE PIE! EXPLORE the School of Friendship and meet a whole host of characters! UNLOCK new areas on campus as you complete challenges! PLAY as a student character from MY LITTLE PONY: Friendship is Magic! BONUS: Come back every day for your daily reward! Before you download this app, please note that it is free to try, but some content may only be available via in-app purchases. In-app purchases cost real money and are charged to your account. To disable or adjust the ability to make in-app purchases, change your device settings. This app may contain contextual advertising (including the option to watch ads for rewards) from Budge Studios regarding other apps we publish, from our partners and some third parties. Budge Studios does not permit behavioral advertising or retargeting in this app. The app may also contain social media links that are only accessible behind a parental gate. very simple but simply fun. I just wish it didnt force me to pay to progress. I’m currently stuck because I don’t have the right lv for my current color. I can’t use my coins, I have to use the gems to get a randoms. which basicly cant promise the character you will need. The game is really nice and addicting! But at some point of the game, every single task takes a ridiculous amount of time to load for some reason (something that didn’t happened before) I would be nice if you could fix this problem. We are actively looking into this. Please make sure to update the game to the latest version when available! Fun, but needs tuning. 3-orange level requirement is an artificial block to slow down progress. There are no Legendary orange ponies, and common ones will not suffice. This requires at least one, probably more, mid range pull, which is a steep requirement just for one level. It’s clumsy level design, and completely halts gameplay. This game is really good. It has a lot of potential to be an even better game. Just a suggestion for the developers, may you guys add more ponies, like Daring Do or Starswirl? And may there be like weekly or daily challenges to add that replay value? Finally, and this may be a bit of a stretch, may you guys continue this game after Gen 4, then possibly add the Gen 5 ponies? Overall, this game is surprisingly challenging and good. I hope that there could even be a pvp mode even. Thank you so much for the feedback! If you have any other suggestions, please share them with us at support[at]budgestudios.ca. A fantastic game for fans of the show or for folks who enjoy tbis kind of shuffleboard style. the only issue is color-coded challenges which seem a tad unfair and rely on pay to play. other than that, great.